Review of data provided by Boston’s Inspectional Services Division shows more than a dozen buildings have racked up hundreds of violations. Sixty percent of Boston residents rent and the city is in the midst of an affordable housing crisis. Our investigation found many of the landlords with the most violations fail an inspection, and then fail the re-inspection. The woman in her 80s has lived in her Roxbury apartment for 30 years and often struggles with her deteriorating home on the one hand and the potentially risky decision of calling her landlord to complain on the other. “We have a raggedy house,” she said. NBC10 Boston is withholding the identity and address of the woman and her adult son, who does not live with her. They both fear that speaking out will mean losing the elderly mother’s home. “I’ve seen they complain too much, they no longer live here,” the son said. Five years after a Boston University student died, trapped in an attic fire with only one way out, and the city approved a new rental inspection and registration system, inspection officials and community housing advocates said that housing conditions have improved throughout the city. The map below shows rental properties with the highest number of violations from January 1, 2017, until now. Click on each point to see the number of rental units per property and the number of violations it has racked up. But a review of data provided by Boston’s Inspectional Services Division, which inspects rental housing and enforces the city’s housing code, shows that while most of the scores of residential rental buildings have few or no housing violations, more than a dozen buildings have racked up hundreds in the last 18 months. “We think overall, the housing stock in the city of Boston in the past five years has come up remarkably. Is there more work to be done? Yes,” William “Buddy” Christopher, commissioner of Inspectional Services, said. Sixty percent of Boston residents rent. And for all that Boston offers, or perhaps because of it, the city is in the midst of an affordable housing crisis. And sometimes finding affordable housing comes with a hidden price. “You’re fighting against the giant. It’s David and Goliath. So how do you win?” the elderly woman’s son said. City inspection reports show their building infested by roaches and rodents, no screens on the windows or doors, broken door frames, missing kitchen cabinets and floor tiles, a “black substance on the bathroom shower wall and ceiling,” and on and on. “How is it addressed? Here’s four, five cans of Raid and some stickies for the mousetrap,” the son said. City inspectors said that landlords are doing a better job fixing up violations. “Most of our calls come in through an occupant, the family,” said Iris Jones, one of the city’s 28 housing inspectors. They are charged with checking up on Boston’s 162,000 rental units. “It’s 60/40 landlords in compliance now compared to years ago,” she said. In the past, Jones said fewer than half were in compliance on fixing violations. And Jones said progress is ongoing to fight landlords who bully tenants. “Intimidation still is a factor, so you still have tenants that hesitate to contact the city of Boston,” she said. The NBC10 Boston Investigators pored through two years’ worth of housing inspection data provided by Inspectional Services. Page after page showed units failing for rodents, mold, no smoke detectors, among a slew of violations that range from the minor—cracked toilet seats—to major structural and health hazards. A housing complex on Cedar Street in Roxbury complied 582 violations between Jan. 1, 2017 and June 2018, according to the data. The complex is owned by Lorenzo Pitts Jr. It was stuck in limbo following the death of Lorenzo Pitts Sr. and a legal fight among his children. Other landlords have hundreds of violations over multiple properties. It’s the same violation, same failure over and over and over. Representatives of GBM Portfolio, which owns two apartment buildings on River Street on the line between Hyde Park and Mattapan, disputed the high total of violations shown in the inspections data. City data shows 478 violations for 731 River St. and 370 violations for 720 River St. in the last 18 months. The buildings have 21 and 15 units, respectively. The owner said the repetitions are often the result of inspectors not being able to access a given unit for a re-inspection. Old violations are not reviewed and closed and show up again on new reports, meaning they should not be held against them. But a review of city data shows repeats for health and building violations, like rats, mold, and living conditions, rarely repeat once the inspectors gain entry for the first time because the inspectors often are successful in getting inside for the re-inspection. John Gosnell, head of operations with Advanced Property Management, which works with the River Street buildings, said the violations inspectors find are remedied right away. Other properties include 134-136 Everett St. (264 violations) and 3 McCormack Square (256 violations). Both are in East Boston and are owned by Solskinn Properties, LLC. Messages left on the office number of SolSkinn Properties were not returned. And 53 Hancock St. (168 violations) and 62 Clarendon St. (166 violations), owned by developer Charles Dumbaugh. Emails were sent to Dumbaugh seeking comment. Christopher said inspectors do still have problem properties, but has changed focus to be more oriented toward solving problems than issuing tickets. But the city still has a long way to go, some tenants fear. “We want a roof over our heads. That’s it. 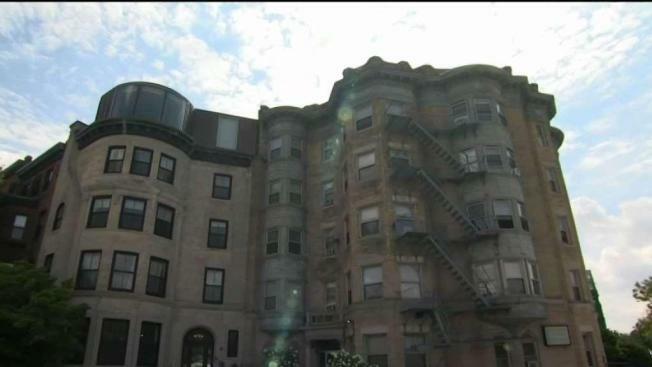 We want a roof over our heads,” the elderly Roxbury woman said. “To them, it’s not a violation until somebody gets hurt,” said her son.